One of the most comprehensive studies into media sharing and consumption habits in the United States and Germany reveals that file-sharers buy 30% more music than their non-sharing counterparts. The result confirms that file-sharers are actually the music industry's best customers. In addition, the research reveals that contrary to popular belief, offline "copying" is far more prevalent than online music piracy. The major music labels have a clear stance on online piracy, as the following quote from the RIAA illustrates. This “devastation” translates into billions of dollars of lost revenue over the past decade, the RIAA claims. The more music people pirate, the less they buy is the underlying reasoning. Intuitively this might make sense, but looking at hard data a different pattern emerges. Today the American Assembly, a non-partisan public policy forum affiliated with Columbia University, published a teaser of its forthcoming Copy Culture Survey. The study is based on thousands of telephone interviews conducted in the United States and Germany and provides a unique insight into the sharing habits in the two countries. The preview zooms in on the digital music collections of people. Not just how much music people have on their computers, but also how they acquired these files. As one would predict, it shows that those who are self-confessed P2P file sharers have larger music collections compared to those who aren’t. However, the data also shows that these file-sharers buy more music legally than their non-sharing peers. 30 percent more in the US. “US P2P users have larger collections than non-P2P users (roughly 37% more). And predictably, most of the difference comes from higher levels of ‘downloading for free’ and ‘copying from friends/family’,” American Assembly’s Joe Karaganis writes. The graph above shows that in Germany the results are even more pronounced. 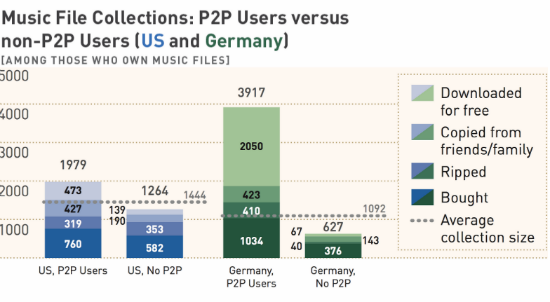 P2P users there buy nearly three times more digital music than their non-P2P using peers. However, the number of P2P file-sharers in the German sample is too low to be statistically reliable so these results should be interpreted with reservations. While the survey is unique in its scope, this result of does not stand in isolation. In the past we have documented studies that show how the majority of artists sell more music thanks to piracy, and that people who download more also buy more physical CDs. Yet another study found that pirates are 10 times more likely to buy music than those who don’t. A likely explanation for these results is that true music enthusiasts simply want to consume, sample and discover as much new music as they possibly can, and the most straightforward and convenient way to do this is through file-sharing networks. For this group file-sharing is mostly complementary. In any case, P2P file-sharers are not all cheapskates, quite the contrary. In addition, the research also point out that while P2P file-sharing is a common way for people to acquire files, offline substitutes for digital music sales are bigger. Ripping CDs and sharing files with friends account for a higher percentage of people’s music collection than P2P file-sharing across all age groups. This confirms earlier findings from a leaked RIAA report. More interesting findings on the digital music collections of people in the US and Germany are available on the American Assembly blog. c There are 134 comments. Add yours?